Hey! Thanks for your feedback! What you mean about branching strategy? Using, for example, different branches for "documents", "images", etc.? If that's the case, I had thought about that before and actually that was how I was going to go at first. However after a bit of thinking I quit that idea because it'd eventually make it hard to search files on local system and navigate through directories because I'd have to change from a branch to another every time I needed something different. Anyway I'd love to hear about your ideas on branching strategy on such system! You could use branches as an additional partition--so that, for instance, on a personal device you need only check out the personal branch. And on a dual purpose (business and personal) device, you could have two clones, each checked out with a different branch. Dunno, maybe not .. But this is exciting! I feel like I am going to be all organized now! I used Trello before and I still have some projects managed there. 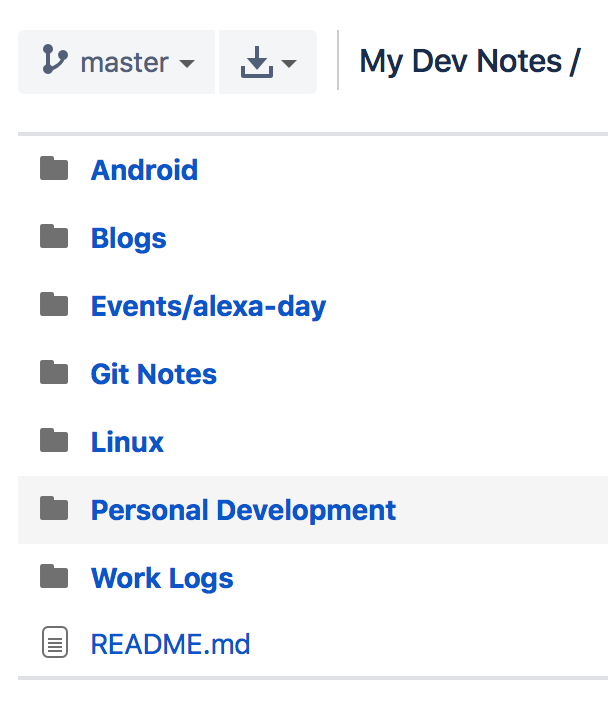 However it lacks the "file storage" feature that git brings into my workflow and as Github also has the "Projects" feature (more or less like Trello) I prefer to keep all my things in one place to avoid confusion. That's one of the reasons that made me switch to this system. Thanks for your feedback! Hope you find this system useful in addition to Trello or even as a replacement. That one was a heck of a nice idea João. Also sometime ago I read this article (producthabits.com/why-trello-faile...) showing why Trello stagnated not developing/hearing/measuring true needs and lacked innovation as time passed. This opened way for lots of other services to not only copycat this card/kanban feat but to actually bring value which is what we have with GitHub in this excellent way having everything, files, branches, projects, wikis all in the very same website! Me too, have you ever used Trello hooks to make it IoT and cloud ready? I also use Trello for this sort of thing. Trello hooks are not something I've explored though, I'll have to check that out. For a while now, I have been using github for my exercise alternatives. I have been compling a list of different exercises for the different major muscle groups and I update the list whenever I learn about new exercises. Also I can add links with video instructions if the exercise name is not as meaningful. This system has proven to be very useful to me, better than any app I've found. Very nice indeed! I think it's the first time I see someone using Git for such purposes, but that only shows the power that it gives us to simplify many processes in our daily lives for which most people would install yet-another-app in theirs smartphones. Thanks for sharing your experience! Really interesting! Great idea, the only weak point might be search, compared to an alternative like Gmail, which has superior full-text search capabilities (however if you use Max/OSX you already have very powerful "local" full-text search with Spotlight, which you can apply with your local Git files). Also, you need a private Github repo of course, which costs money, so this solution is not free. For the rest, a very interesting idea. Revision control can of course also be a lifesaver. You touched an interesting point I really haven't thought about: searching. But I think the reason I haven't thought about that is simply because on my laptop (using Linux) I can search files and documents really easily within the "Files" software and it hasn't shown any issues so far! Sure, for this kind of stuff you must use a private repository, but there are free alternatives if you don't have or don't want to subscribe a paid plan on Github! Bitbucket, from Atlassian, allows any free user to create private repositories and also have (recently I think) project management features (and integrates well with Trello). You could give it a try if you'd like to test this system! Search is actually a strong suit of this approach: if you store everything as plain text you will be able to search all of your content using Github if online, or grep if you are local. Fantastic!!. 'Git' can be a great tool to simplify lots of the day-to-day activities. I use 'Bitbucket' for similar purpose, but only for tracking my office work. I use 'markdown' for taking notes & to-do list. Here's how I have been doing it. You might find it useful. Here's a blog I posted some time ago. If you change the date format in your last screenshot to YYYY-MM-DD, then they'll sort alphabetically chronologically. So 2017-10-02. Very nice! Thanks for sharing your experience! It also seems a good way to organize dev-notes, for example! 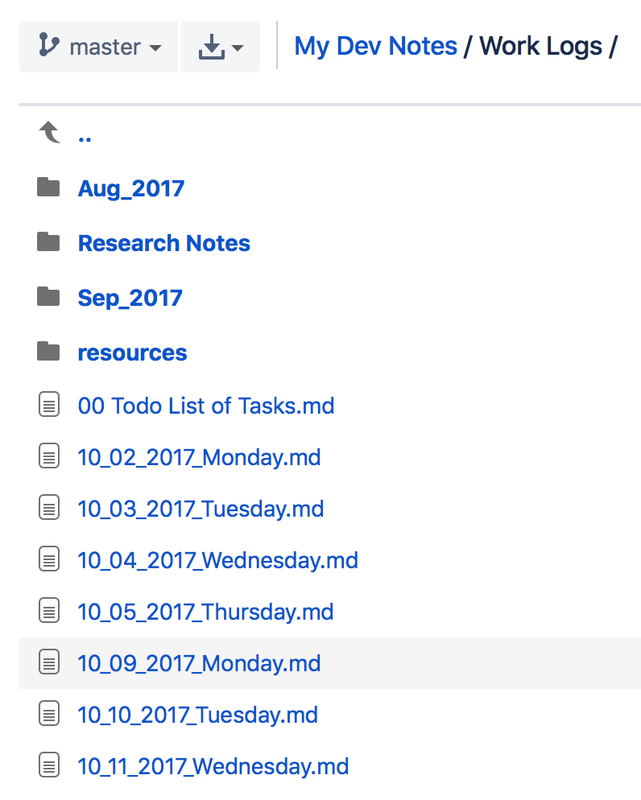 However for the tasks I still prefer the Github Projects (I think Bitbucket already has a similar feature) because it allows me write each task in more detail and follow what needs to be finished easily. Although I see some advantages of using a Markdown file, such as managing the tasks everywhere, independently of the software you use for managing git repositories. Great idea. I'll give it a try. I've been attempting to use Microsoft's OneNote to organize thoughts and files. It is the only Microsoft product that I like. Been working with it about 9 months. I use it online via Linux Chrome browser and from my Android phone. However, its search capabilities are nil or non-existent. I'm ready to try the next idea. Hey David, thanks for your feedback! I'm not a big fan of Microsoft's products and the only one I use is VSCode because I really like it. In sum, I'm not the best person to comment your experience with OneNote. However, regarding Git/Github, I can assure you that your search needs will probably be fulfilled because Github itself provides a very decent file searching feature on repositories and also, depending on your OS (which I assume to be Windows version X), you'll also have the advantage of whatever search capabilities it provides for files (in Linux it's really good). Hope Github is a good choice for your workflow and that it fixes the headaches you've been going through. Thanks for your feedback and for sharing your experience! Will definitely read your post for more ideas to improve this system! I already thought about using Wikis somehow, but haven't thought about anyway they'd be useful in this case. I guess I was wrong and that you'll enlighten me on that! Ingeniouse! What a wonderful idea. I will most definitifly try it out. If someone is looking for a alternative to github I'd like to recomend gogs.io as a github-like go-based software. You "just" need your own server to run it. Thanks for the awesome feedback Peter! I wasn't aware of Gogs so, thanks for sharing that with us! It can be a really good alternative for someone looking for a really private solution or more disk space available (Github "limits" repositories sizes). Hi João, thanks for this great article. I started using it the same way as you do and it feels like it is a perfect fit for me. I never created so many issues but I also never got so many things done! I only use two projects (private and work) and if there is something that could be a project by itself I create a milestone for that which gives me a nice overview of the progress. So thanks again for sharing, it changed a lot for me! Nice! I guess a lot us have struggles when it comes to manage our personal lives and this can be really helpful. I see that your idea sounds a lot like a kanban board, except by the documents. I think that a well adapted kanban software may be more accurated and easy to use since can bring us a grafical view of what really is going on at the moment. Btw! It's my first participation on the community, i'm glad to say hello to every one! Hope my english is good enough! Wow, thanks, this is really clever! By the way, if people want to achieve the same but for free, they can maybe use Gitlab.com. The free account allows to use private repositories and issue boards that look like the ones from Github. Very Cool! Ironically, I just started using github as my main "project management" tool, for all (in hindsight) obvious reasons that you state for using github just this week (after flopping back and forth between trello, asana, todoist, workflowy, etc. It just never occurred to me to do this for my personal life, excellent idea! I think about doing something like this sometimes but then talk myself out of it by understanding one system is for code and another system has to be for my life, tasks, events, and such. There are a few things I would love to version control, but even then I can't use anything except rich text files or maybe even GFM. I wonder what type of files you're storing in this repo since you're only able to actually get the final version from that save-cycle. I use a similar system. I find it useful because of the following aspect: we generally only commit/push code when work is done. It's a good feeling, possibly even a dopamine reward in the brain. So, I find that I'm motivated by the same reward to complete my TODO tasks in my personal stuff. I could totally see how each of my girlfriends could be a branch. Here is to one day be able to merge one of them into master. I saw you have "photos" folder. isn't a git repository limited to 1GB? did you plan to store there private photos? it would eat quota space wouldn't it? Hey Tomer! Thanks for your feedback as it may answer others doubts regarding that question as well. Indeed I've a "photos" folder, however I use it just to store the current avatars I'm using at the moment on my social networks and other websites/communities. All my "real" photos, I mean photos from family, friends, dogs... you get it, go directly to my external drive. I've never stored those in cloud storages because it seems a bit inefficient when you later want to navigate through them all, but it's just a personal opinion. We recommend repositories be kept under 1GB each. This limit is easy to stay within if large files are kept out of the repository. If your repository exceeds 1GB, you might receive a polite email from GitHub Support requesting that you reduce the size of the repository to bring it back down. - What is my disk quota? Thank you once more for placing that question, hope I've answered it clearly! Damn I really like this idea. Nice one. Hey Adam, thank you! Glad you've liked the idea! I like the approach a lot but the one thing holding me back from using it is the lack of a mobile interface (or at least a good one I could find). The GitHub website can be displayed in mobile but it's not super easy to use from a phone (as of the last time I tried it several months ago). Do you have any suggestions for this? I love your ideas. My challenge always seems to be decent mobile access to my notes. The git log becomes a meaningful diary. Nice write up. Will try your approach. I used to use vimviki and have a cron job commit the changes on a daily basis, but this seems more interesting. Very interesting idea! Thank you for sharing that :-) Regarding the tasks for myself - I do the similar, but inside PivotalTracker. Just wanted to drop a note to say thank you. I've used software for notes and other software for todos. This seems like a great way to merge the two.